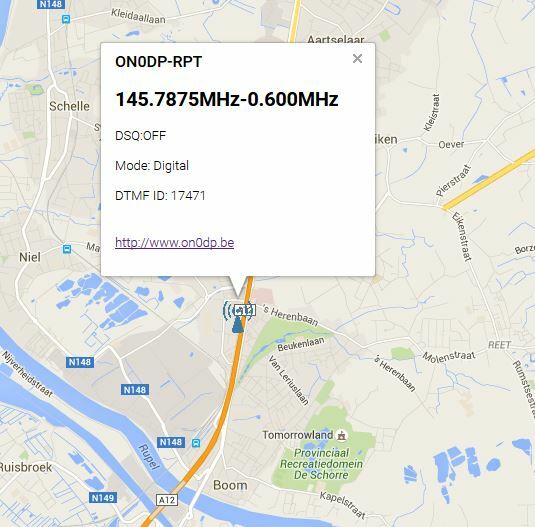 Our repeater was born as a necessary D-Star access point for the region mid Belgium. Because in the early D-Star years 2008 there was no repeater or hotspot in a radius of 70km. Before that time we do some test with the first Satoshi D-Star hotspots. So the ON0DP UHF D-Star repeater was starting in 2009 and linked to the D-Plus gateway, followed in the year 2010 by the 23cm D-Star repeater. In the recent years new reflectors were added so we have optimally configured our system so that users can be connected to all directions. Today all D-Star applications are active included DPlus, ircDDB , StarNet, xReflector linking (DCS/CCS) and GPS tracking .The ON0DP D-Star repeaters may any time be linked to each repeater,group,reflector of your choice. In the summer of 2013 we decided to replace the UHF D-Star repeater by a DMR repeater. So from that moment the (UHF) D-Star repeater was out of service. Due the need for D-Star access in our region we have decided to put a VHF D-Star repeater on the air. From January untill september 2014 ON0DP D-Star was active on VHF. Since the summer of 2014 Yaesu introduces the C4FM-System Fusion repeater so once more we have decided to go for a third digital amateur system. End September 2014 we replace the VHF D-Star repeater by a VHF System Fusion. For our D-Star users we put our UHF repeater back on the air on the new frequency 438.462.5MHz.